This is one of four mother and baby boxes that Peter carved during 1993. 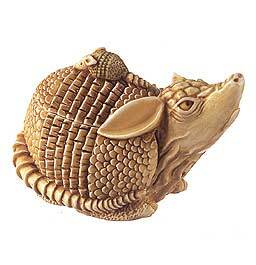 Peter was drawn by the texture possibilities of armadillo, and enjoyed putting in the bands and scales. Notice that the mother is 6-banded, and the baby 3-banded, to show that the baby is half of his mother. The baby is atop the mother rather than snuggled underneath to provide a handle for the lid. The mouse does not appear on this piece, nor do any inner carvings or inscriptions. The only hallmark is PC below the tail.